Los Angeles Cardiologist Dr. Jamshid Maddahi utilizes the technology of MRI (Magnetic Resonance Imaging) to create still and moving 3-D images that show plaque or blockage in the arteries and blood vessels. With this type of heart scanning Dr. Maddahi can see how your blood flows through your heart. Through this, we can determine if your heart is injured by plaque build-up in the arteries; check valves and chambers, and check on any prior surgeries on your heart. As a professor at UCLA, Dr. Maddahi is constantly receiving new information in the field of cardiac care. He does not have to wait 10-20 years for that information to become mainstream. This means you are getting the latest improvements, the best treatment as it becomes available. 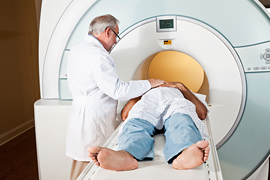 Non-Invasive Testing: You do not need an operation for us to see inside.